IT IS BANSHEE! Check out our coverage! Wow, News is finally coming out of Mason, Ohio! Kings Island will be announcing what their new attraction is on August 8th, 2013 at 10pm directly after the fireworks. This is the new "record-breaking" attraction which will set on the former site of the 'Son of Beast' roller coaster. 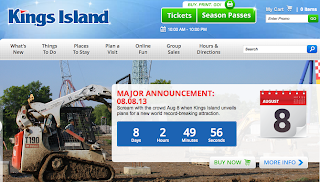 We reported on this earlier in the season when King's Island still had the teaser announcement posted around the current construction site. This area has been in limbo since 'Son of Beast' closed for good in 2009. Well rumors have gone wild over what may be taking over the space. However, all that is known at the moment is that whatever this will be Kings Island is touting it as "World Record Breaking". That's a pretty steep order to offer up considering some of the rides that are on the record list! Well, we found out through listening to the rumors whatever it may be, the new ride will likely be called "Banshee" as the rumor-mill has stated that name has been trademarked by Kings Island. Today on Facebook this nice little picture showed up! The teaser caption is "Part of the Haunt or Part of the New Record Breaking Ride? Find out Soon". 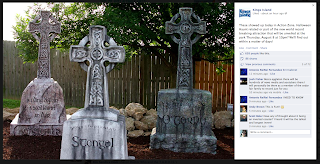 Well considering banshees are a heavily Irish myth and those are obviously Celtic crosses, I'm going to go with part of the new attraction! Looks like we may be getting an "Irish" type theme for this ride? Who know but we're going to keep on this like an obnoxious bloodhound! 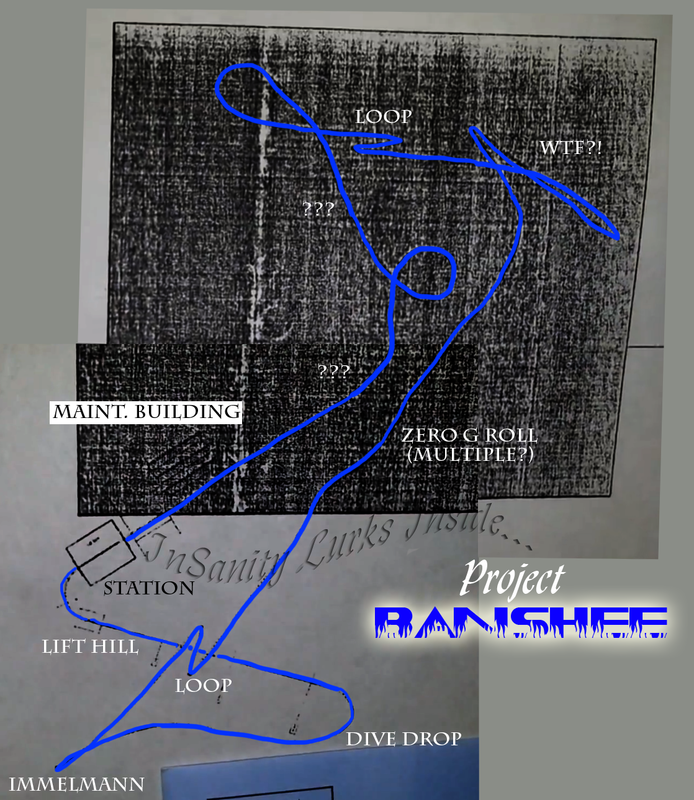 It looks like "Banshee" is going to be the official name of the new ride going into Kings Island after yesterday newest "teaser picture". It shows a silver comb with a "save the date" card for the announcement date. "Why a comb" you ask? In mythology Banshees are said to always wear white or gray and have very pale hair which they "Comb" with either a "silver or gold" comb. To take the comb away from them would banish the banshee but if you spot one laying on the ground you should never pick it up as that is the Banshee's way of capturing humans. So this newest hint fits it perfect with the running rumor of the attractions new name. However, there is still no word on exactly what kind of record breaking ride this is going to be. Everyone is sticking with the idea of a roller coaster but what kind has been wildly spun. Everything from another new Wing Coaster (like the disappointing Gatekeeper) to a new Inverted (like Raptor or Montu) or even possibly a new wooden coaster to replace Son of Beast. Fact is, we just don't know yet! 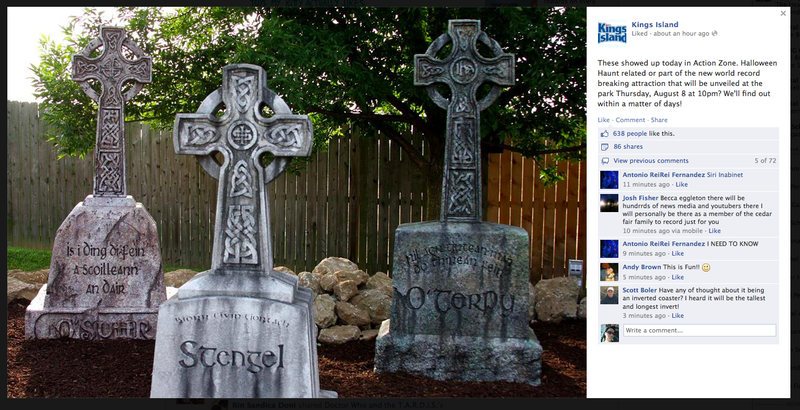 Well it's been interesting, Seems like Kings Island played a little joke on the masses. Have to give them credit for style at least but upon seeing this, something clicked in my head. Let me put the pieces together for you the way they snapped into place for me. The original "Bat" was a suspended swinging coaster much like "Iron Dragon" at Cedar Point or "Vortex" at Canada's Wonderland. Now these coasters aren' t popular anymore and are very expensive to maintain so I highly doubt they would build that style. Next, everything for this "Bat is Back" splash page was in Latin. 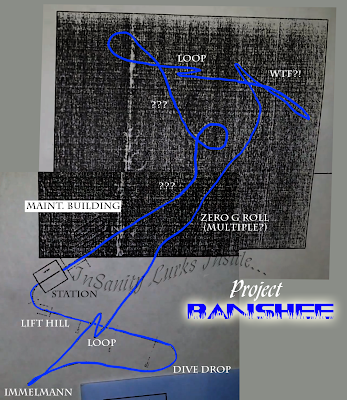 Celtic Crosses, Working project name/ride name of Banshee? Yup, Latin makes sense and it isn't going to be the return of "The Bat". 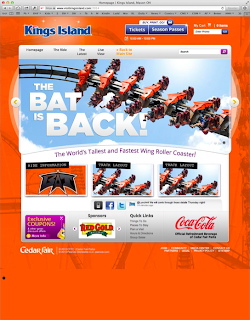 Now, everyone is crowing about this new ride being a "Wing Coaster" like Gatekeeper at Cedar Point. As much as I hate to hit the brakes a little early but let me poke a few dozen holes in this idea. Cedar Fair is not likely to build another wing coaster, especially in the same state and announce it during Gatekeepers opening year. That is shooting themselves in the foot with an elephant gun and admitting that Gatekeeper is crap (which is it) and if you know anything about Cedar Point and Cedar Fair, they just aren't going to ever admit a mistake nor allow another park to take the limelight off their "showcase park". Okay let's rewind a moment after processing all the stuff I've thrown at you so far. "The Bat" was a clue, I'm sure of it. Add in the announcement of "World Record Breaker" and I think I've got this nailed. So I'm going to take a running leap in the dark here folks and try to call this one: World's Longest (and possibly most inversions) Inverted Coaster! Now I have an addendum I'd like to add onto this because I've had a completely crazy idea. What if B&M and Cedar Fair had a crazy idea and meshed up a "Wing Coaster Train" and an "Inverted Coaster Track"? Because I'm going to tell you right now, it's completely insane and I love the idea as soon as it dawned on me. Probably not possible but I'm covering my bases as it still fits into the "Inverted" call! Why do I think that? Keep Reading because I'm about to give you folks Christmas in August! Blueprints have been leaked and we've found them! Honestly, I have no idea why more people haven't picked up on this little video hidden away on YouTube. I admit, some girlish squealing happened when I got a glimpse of these plans. I'm no expert in reading blueprints but it's pretty obvious that this ride is going to be a monster. We took a few stills from the video and patched them together to try and give readers a sense of scale and the elements involved but we (roughly) count at least 8 inversions and possibly more! Now, don't quote us on any of these elements because we here at ISI Central are going off what we know from our own coaster riding experience. Some of them are pretty obvious and others are just unknown. Now, go make squeaky joy sounds. Even if we don't know WHAT it is, we know what it's going to look like! InSanity lurks Inside will update as more information becomes available, Keep Watching! Although I got to admit, the time seems really weird. 10pm after the fireworks?